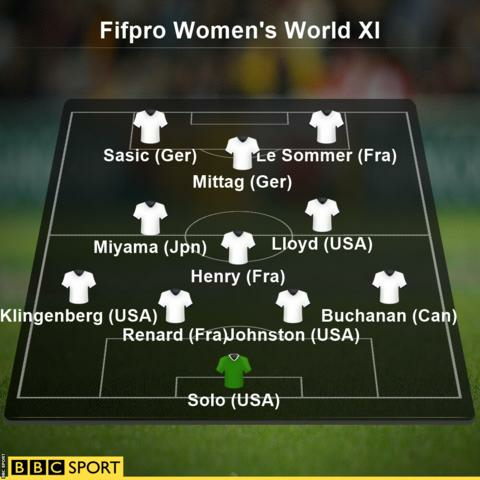 No England players have been named in the inaugural Fifpro Women's World XI - despite the team finishing third at the 2015 World Cup in Canada. Lucy Bronze, who was shortlisted for the player of the tournament award, is among those overlooked. Four Americans are in the Fifpro team, including midfielder Carli Lloyd, the 2015 World Player of the Year. The team, which also includes three Frenchwomen, was voted for by players from 33 different countries. Fifpro, the global players' union, has named a men's team of the year every year since 2005. World football's governing body Fifa names only a men's XI at its annual Ballon d'Or gala.